The MT174 electronic three-phase meters are designed for measurement and registration of active, reactive and apparent energy and demand in three-phase four-wire networks. They can be connected directly to the network. 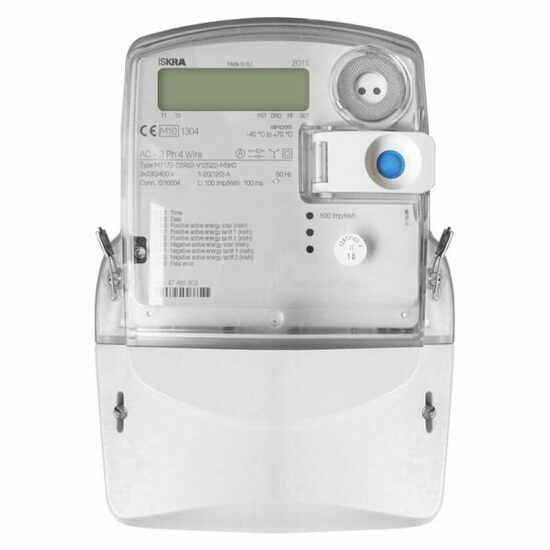 The metering and technical properties of the meters comply with the EN 50470-1 and -3 European standards for active energy meters, classes A and B, as well as with the IEC 62053-21 and IEC 62052-11 international standards for electronic meters of active energy for classes 1 and 2, and optionally with the IEC 62053-23 international standard for electronic meters of reactive energy for classes 2 and 3. 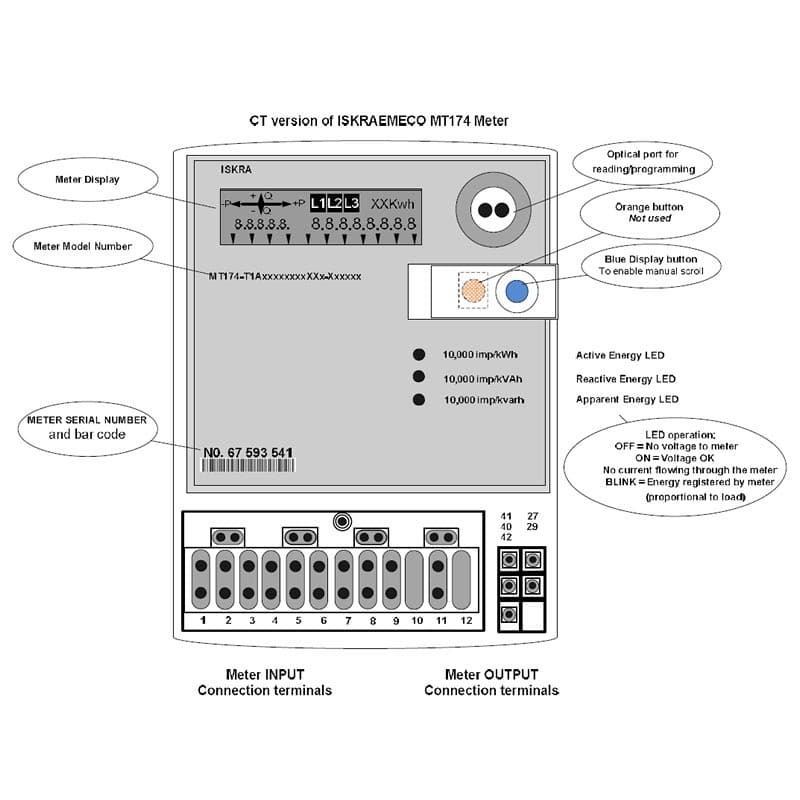 A built-in time-switch complies with the IEC 62054-21 and IEC 62052-21 standards. It enables energy registration in up to four tariffs. 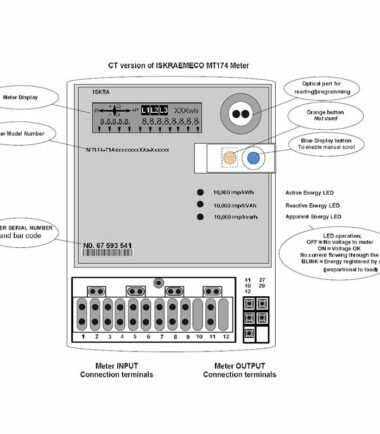 The meter software complies with WELMEC 7.2 Issue 1 Software Guide (Measuring Instruments Directive 2004/22/EC). The MT174 meters are designed for mechanical environment M1, electromagnetic environment E2 and climatic environment -40°C … +60°C, relative humidity 95% non-condensing, closed location. 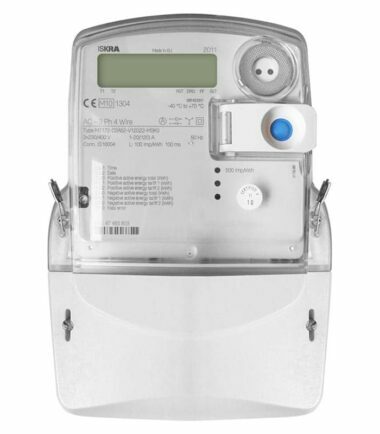 The meters can be installed in any position. The meters are designed and manufactured in compliance with the ISO 9001 (2000) standard. 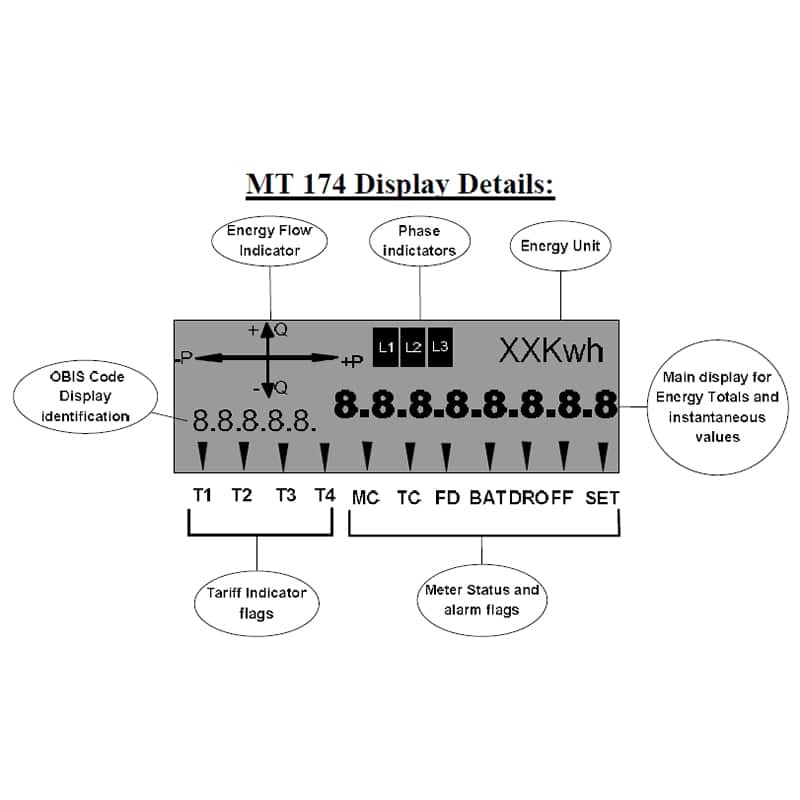 The MT 174 display will auto scroll to show the required readings. Note: No buttons need to be pressed during normal operation of the meter. The BLUE button can be used to manually scroll through additional readings for information and diagnostic purposes. 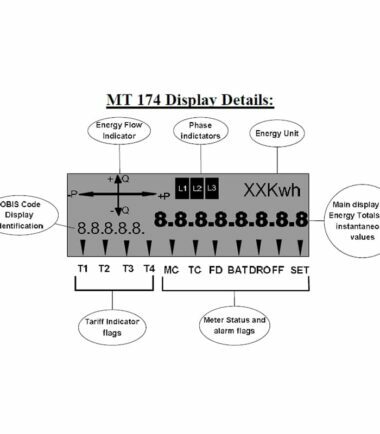 The OBIS code appears in the left of the display and the relevant reading on the right.